One faces a number of thermal risks at work. For the protection effect of the gloves it is important to differentiate between ambient heat or direct contact with hot objects. Risks are also involved when faced with extreme heat caused by fires, radiation etc. Heat protection gloves should have wear resistance properties and also a certain level of cut resistance. The minimum wear and tear resistance according to EN 388 is specified for protection gloves of the EN 407. 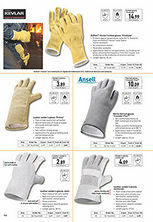 Fire-resistant and heat-resistant protection gloves from engelbert strauss offer day-to-day safety at work. DuPont™ Kevlar® are registered brands and trademarks of E.I. DuPont de Nemours and Company. 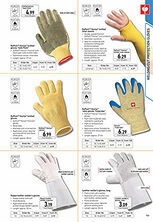 The gloves made of DuPont™ Kevlar® offer excellent protection. The high-quality artificial fibres are extremely wear-resistant, tear-resistant and protect against heat and cuts. Thanks to the low heat conductivity, the hands are well protected even in extreme temperatures.